Abyssinian Cats - The Abyssinian cat is a breed of domesticated cat which is sometimes believed to have originated from one Egyptian female kitten called Zula that was taken from a port in Alexandria, Egypt, by a British soldier and brought to England, which is unproven. There has also been at least one, and possibly as many as three Abyssinians introduced from Libya (or less likely Egypt) into the existing Abyssinian gene pool in the USA. Many sources spread the story that the Abyssinian breed is a few thousands years old and that it directly comes from ancient Egypt. The Abyssinian has become one of the most popular shorthair breed of cats in the USA. The Abyssinian's body is of medium length, lithe, with well-developed muscles. The legs are slender in proportion to the body, with a fine bone structure. The paws are small and oval. 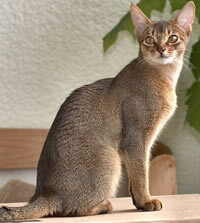 The Abyssinian has a fairly long tail, broad at the base and tapering to a point. The head is broad and moderately wedge-shaped, with almond-shaped eyes that can be gold, green, hazel or copper. The nose and chin usually form a straight vertical line when viewed in profile. Their alert, relatively large ears are broad and cupped at the base, and moderately pointed at the tips, where tuffs of hair commonly seen. Large ear tuffs are viewed as a must for show breeds. The coat is medium-length, dense, and silky to the touch. The Abyssinian, and a similar long-hair breed called the Somali (cat), have coats that are unusual enough to catch attention. This information is licensed under the GNU Free Documentation License. It uses material from the Abyssinian article on Wikipedia.org. 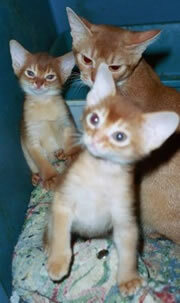 Abyssinian Cat Breeders - Advertise your cattery kittens and cats here. Melkatz Kattery - Florida - We are a small kattery located in the Miami, Florida area. I am a vet tech experienced in animal health care for over 17 years. We spoil our babies and they are our children!! Our Abyssinians are registered with CFA and come in a rainbow of colors including: Red and Ruddy, and Blue and Fawn occasionally. We also have Wedge Show Style Siamese kittens occasionally in all colors!! Our kittens get all three FVRCP/Luekemia and Giardia booster shots before leaving our home at 14 weeks of age. Contact us (toll free) (888) 998 - 7483 for prices and upcoming litters. Abyroad Cattery - New York - Breeding and showing Abys and Somalis since 1984. Home raised, underfoot, in our beds and in our laps, with love and the best of care. Ruddy, Red/Sorrel/Cinnamon, Blue, Fawn and Silvers. TICA and CFA registered. Hillstblues Abyssinians & Somalis - California - Quality kittens in 4 colors for over 20 years, located in Thousand Oaks, California. Health Guaranteed, and references available upon request.